What if the Leaves of Grass was instead called Webs of Grass? 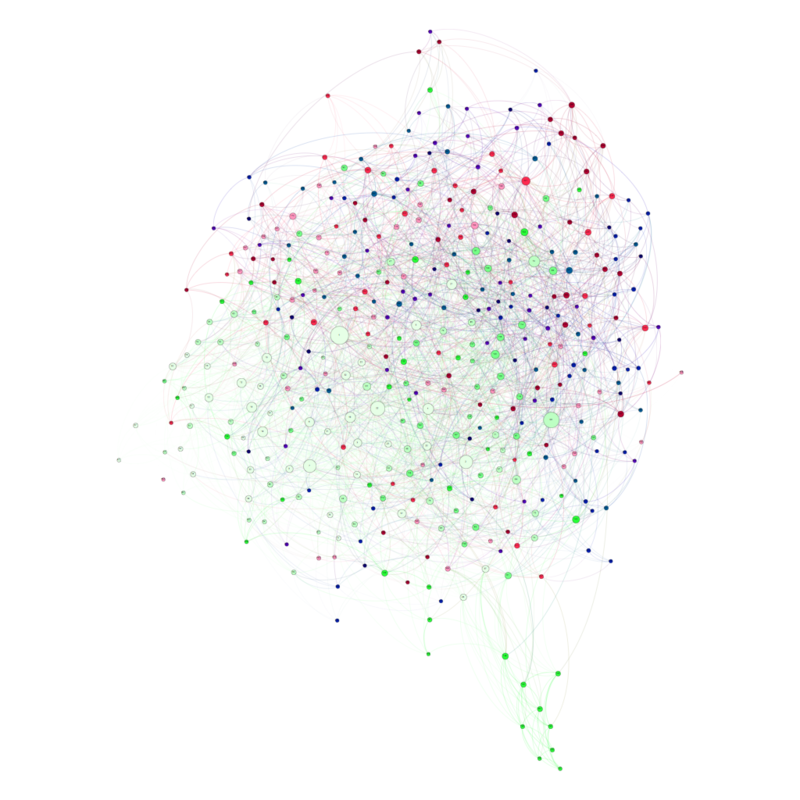 I’ve created a series of network graphs that represent the multiple editions of Whitman’s Leaves of Grass, in which pages are represented as nodes and the edges represent the lexical similarities between them. The networks are drawn in an “evolutionary” way, so for each page that enters, the program measures the distance of the new page to all prior ones based on its vocabulary. It then selects the top 6 closest pages and continues on through the whole work. 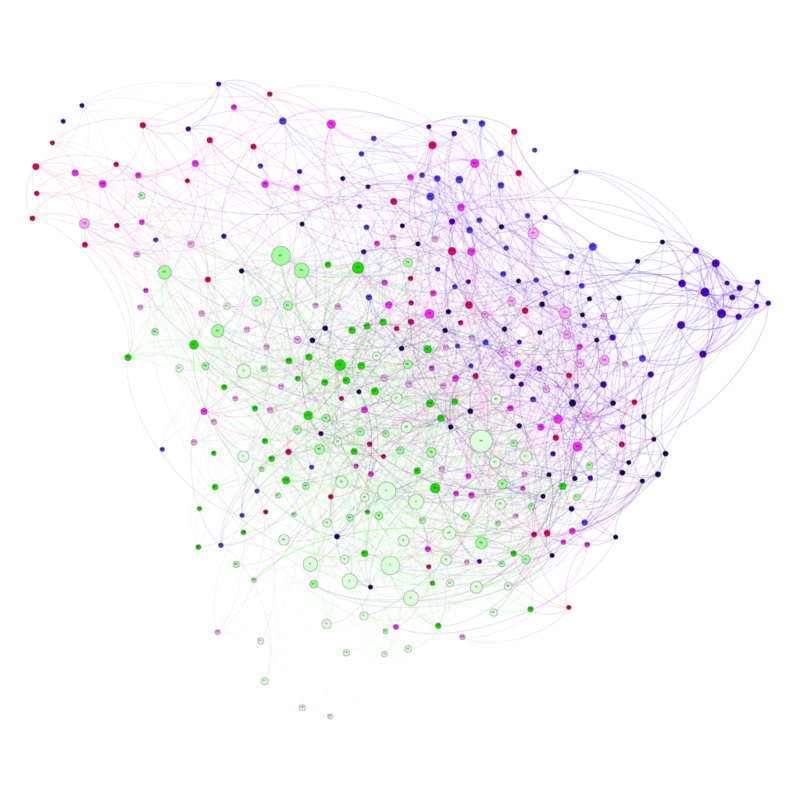 So what you see is an evolving web of relations between the pages of Whitman’s Leaves. This project is part of a larger investigation into the relationship between human aging and poetic expression. Instead of the strong determinism of a lot of recent writing in literary evolution or biopoetics, I’m interested in seeing how writers’ work develops over time and whether there are consistencies between that development. Is there something common about the “career” or the “corpus” when taken as a whole or do we find that career’s are more culturally conditioned, or more expressive of the writer’s personal poetic aims? When I was in graduate school I was trained to studiously avoid biographical criticism, for reasons that are in retrospect not entirely clear to me. It’s telling, in a sign of the times, that one of the greatest proponents of this doxa, Stephen Greenblatt, is finishing his career by writing biographies of poets. We know for example from the work of Ian Lancashire that large-scale linguistic patterns can indicate the onset of mental illness in writers. As he has shown, we can identify with a great deal of precision when alzheimer’s emerges in writers, most often well before they are officially diagnosed. But aside from these more dramatic physiological states reflected in language, I’m interested in the extent to which there might be associations between how we write and how we age. Leaves of Grass (1891). Light to dark green are the earlier pages, pinks the next section, blues and purples the concluding section with the darkest nodes the final pages. Network graphs can be hard to interpret visually, so in order to better understand these networks, I have initially created five different measures: the average lexical distance between pages, the overall diameter of the graph (the distance between the two furthest nodes), the average page range between any two connected nodes in the network, the robustness of each graph, which measures how many random nodes need to be removed before it breaks in half, i.e. 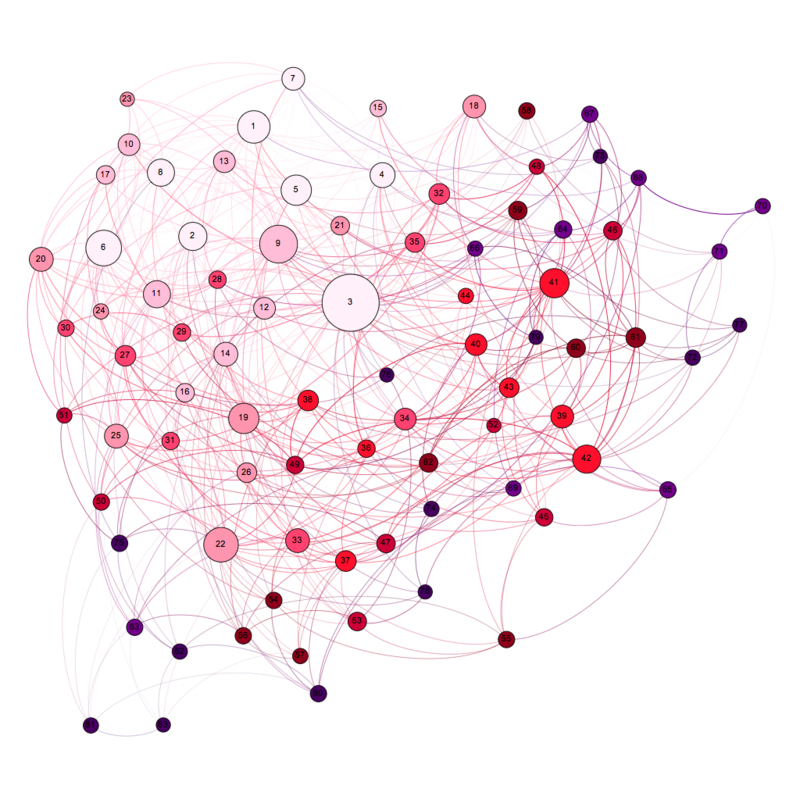 how fragile it is, and finally transitivity, which measures the number of closed loops or triangles in the graph as a percentage of all connections. The higher the number the more closed loops you have, the lower the number the more openness you have. 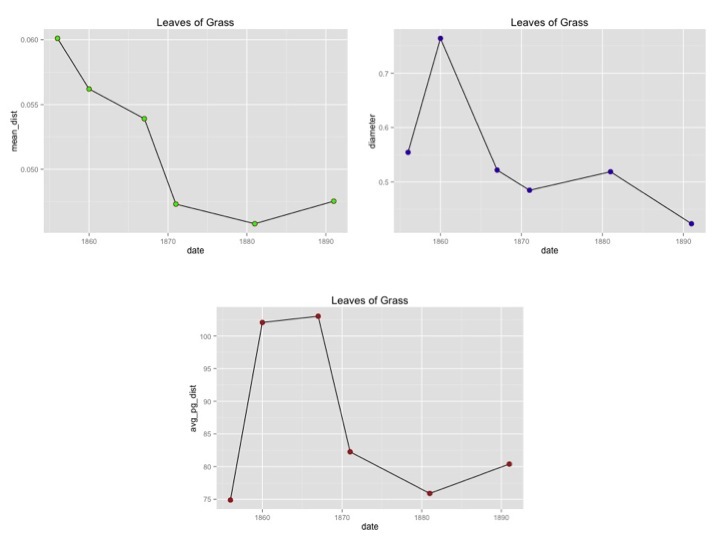 What is interesting about these measures is the way they begin to tell a particular story about The Leaves of Grass as an evolving poetic entity. That story is, I would suggest, one of compaction and consolidation. 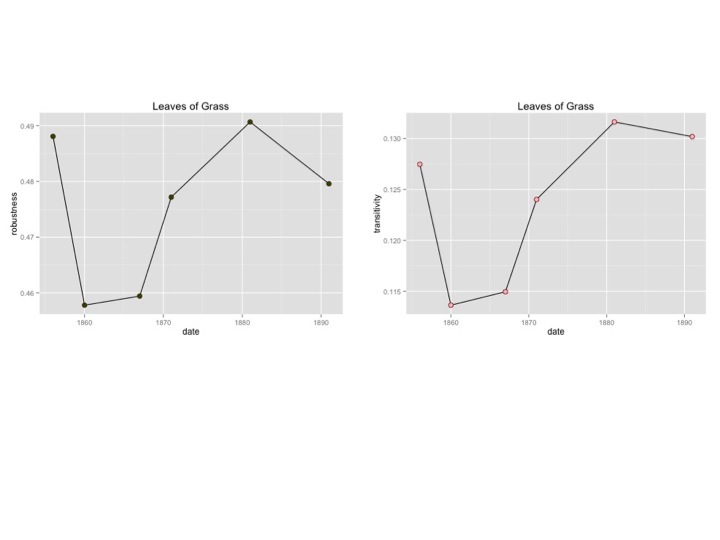 Over time, The Leaves of Grass becomes less linguistically heterogeneous, curling in on itself, as the pages begin to connect to pages closer themselves, as the lexical differences between connected pages decrease, as the overall range of the work shrinks, as the network gets more robust and thus tighter, and finally as the number of closed loops grows. 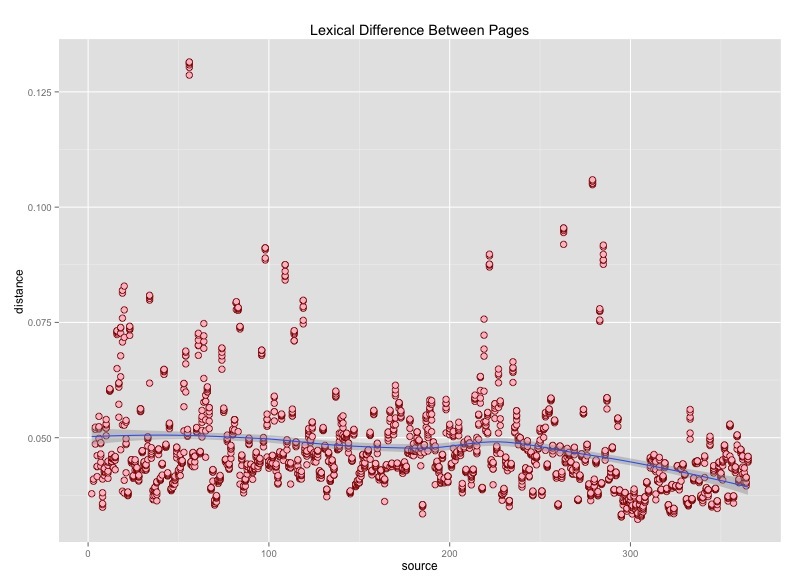 There is a sense of closure to the poetic process of rewriting, which you can see in this next graph that captures the lexical distance between connected pages in the network of the final edition. There is a downward trend of difference within the final work, as the work itself recapitulates this larger process of consensus and closure. 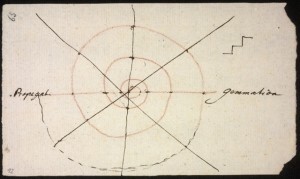 If we compare those 1860 and 1891 networks above to each other, we some confirmation of this in so far as there is something like a paginal arc evolving. Where in the 1860 edition we have what appear to me to be discrete blocks or zones, in the 1891 edition, we move from the light green in the lower left, to the pinks in the upper left to the blues in the right and then the very darkest nodes, which are the final pages of the work entering back into the heart of the graph, so that we could speak of the final edition of The Leaves of Grass as poetic spiral. 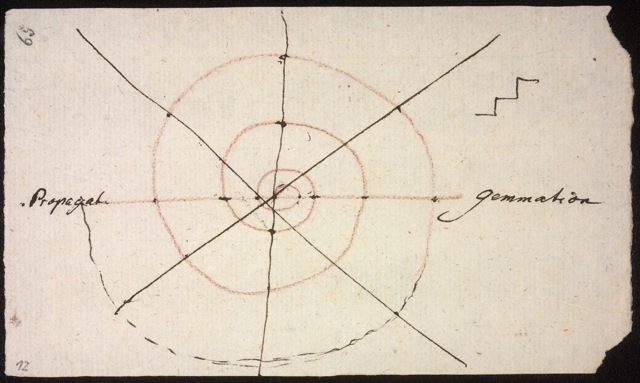 Incidentally this is the Ur-Symbol of all plant life for Whitman’s predecessor Johann Wolfgang von Goethe.